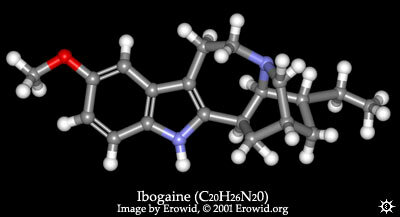 SYNTHESIS : There have been three total syntheses of ibogaine reported in the chemical literature. The first of these was a thirteen step process published about 30 years ago. Although the chemistry lab can serve a fine function for both isolation and purification of ibogaine from plant sources. In other words, there is no practical way to start from a bottle of nicotinic acid and actually prepare useful amounts. The parent ring system contains two chiral centers, neither of which is amenable to easy manipulation. Because of these two separate and largely inaccessible chiral centers there are, in theory, four distinct isomers of ibogaine which are difficult to resolve. When the term "synthetic" is used in regard to ibogaine in the scientific journals, it usually applies to the resynthesis of the parent alkaloid from the demethylated metabolite. For reference purposes, here are the finger print number from the infrared spectra: For the free base: IR (in cm-1): 741, 799, 830, 1037, 1111, 1148; mp 152-153 °C. For the hydrochloride salt: IR (in cm-1): 638, 810, 832, 925, 1031, 1149; mp 299-300 °C (dec). EXTENSIONS AND COMMENTARY : Here is an example of a most remarkable material that has allowed people to have some rather complex and dramatic experiences. Any effort to present a fair overview of its action, through a selection of individual responses in the "extension and commentary" format would fail, as it would ignore the impact of the set and setting on the subject. Here I will mention a few of these different sets, and a leading author to search out more detail. There is no question but that ibogaine is a rough trip, physically as well as mentally. Here is one report that shows the body aspects of its use. (with 200 mg, orally) "Subjectively, the most unpleasant symptoms were the anxiety, the extreme apprehension, and the unfamiliar mood associated with visual and bodily hallucinations. The visual hallucinations appeared only in the dark and consisted of blue disks dancing up and down the walls. Dysesthesia of the extremities. a feeling of light-weightedness, and hyperacusis were other symptoms noted. Autonomic signs, such as dryness of the mouth, increased perspiration, slight pupillary dilation, and increase in pulse rate, as well as extrapyramidal syndromes (fine tremors, slight ataxia, enhanced tendon reflexes and clonus) were also present. The peak effect was reached at about 2 hours after swallowing the drug; it subsided gradually, leaving as a residue complete insomnia. No undesirable after-effects, such as exhaustion or depression occurred." But as fascinating as the pharmacology of ibogaine, it is the chemistry of this alkaloid that is overwhelmingly awesome. The presence of four isomers was mentioned in the chemistry section above, but this fact was not appreciated until the 1960's and even then, a coupe of troublesome errors were made that confused the absolute configuration picture quite badly. The story has been accurately told in a (almost) hundred page review chapter (see Cordell) which is a "must" for anyone who wants to risk understanding some pretty far out chemistry. Oh my, there are a lot of closely related alkaloids. As to indolic alkaloids in general, there are well over two thousand of them, with a few dozen being added every year. And most of these are kosher tryptamines in that they carry the tryptamine structural skeleton. And, in turn, a great number of the tryptamine alkaloids are found in the remarkable family Apocynaceae, which is the ultimate treasure-trove of alkaloids, probably the richest single source of pharmacologically active compounds in the entire plant kingdom. It is made up, largely, of tropical shrubs of the dog bane group, which almost always ooze out a sticky sap when you break off a twig, which have showy flowers, and which have the reputation of being very poisonous. Creoceras, Rejoua, Schzozygia, Stemmadenia and Voacanga, have, with all their species, remained intact with their original names. Peschiera echinata. This is one of some ten species within the Tabernaemontaneae classification, with some 2% alkaloid content in its leaves. Ibogaine is present.